Today, Sunday Oct. 21, 2018, the members of the Red Skies family and friends celebrate an occasion that has not happened in Raven Dist. Of East Harris County, ever. Backing up a bit, Baytown has had Sea Scouts for about 8 years. 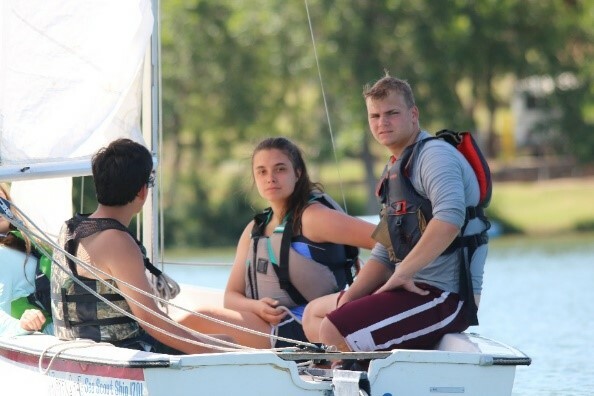 For the last five years, Sea Scout Ship (SSS) 208, aka The Red Skies, have been together because of the support of St. Marks United Methodist Church and Rev. Peter Miller as well as the Church Committee. SSS 208 has grown in the last 5 years with the support of a committee of parents, Skipper Peter Cushman, the author, and Mate Carl Smith. Today the Red Skies and all those attached celebrated 3 young ladies who completed a five-year journey to the rank of Quartermaster. This rank is awarded to young men or women following requirements that insure knowledge and skills that build character, leadership skills, knowledge in seamanship, piloting, maintenance of a vessel, operation and navigation of a course, DO IT , TEACH it and more… Candidates for Quartermaster are held to similarly high standards of Eagle Scout candidates. With far fewer members than Boy Scouts, Sea Scouts have even a smaller percentage of members make it to their highest rank. So, with that background, The Red Skies celebrated 3 Quartermasters to be added to the rolls of SSS208’s accomplishments. Members Shayna Smith, Lelaina Clayburg and Savannah Cushman received recognition for meeting all the requirements for a young person to be awarded the rank of Quartermaster. Presiding over the ceremonies was Commodore of Sam Houston Area Council BSA, Mr. Dan Wilson, honored guests/ presenters included: Skipper Rob Freas Galveston SEAL coordinator, Lynn McKee, Mate 846, Mate Todd Thrash, 1701, Skipper Joy Ang 993 who spoke of the trio of Quartermasters as “Young women who have grown in skills and abilities beyond their age.” In a ship, SSS208, that is welcoming and working with others in the Scouting community, these ladies have individually and combined have a very complete resume’ with activities, work and training. 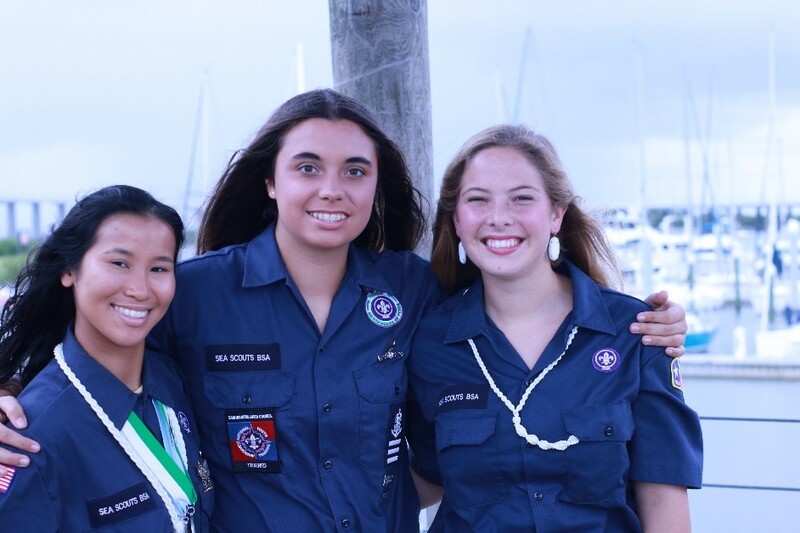 “These young ladies have laid the foundation for The Red Skies, they are what we want young people to become” said the author and Skipper of SSS208. During the Bridge of Honor Mate Carl Smith said, “How many young people get to learn to work on and sail boats, or race offshore, NOT MANY.” As a parent I confess, I wanted my daughter involved in “more”, but at 14 I was not sure what that would look like. When I was introduced into a new type of Scouting, Sea Scouting, that I could do with my daughters…. I was “hooked”. That seems to be the term to describe the feeling that Mrs. Ang, Ship#993, Mr. Thrash SSS#1701 and Mr. Smith SSS#208 all used to characterize their attraction to Sea Scouting. There have been countless days sailing with the Red Skies, working on our boats, diving, camping, and attending other events with other ships in the SHAC fleet. All the work and time has been a growing exercise for me as a parent, teacher and scouter. Most adults that work with a Scouting organization get that same sense of accomplishment from working with the young adults that will lead our future. The committee for SSS208 of Mrs. Phylis Hildenbrand, Mrs. Jenny Clayburg and Ms. Jessica Woods have helped build a network of support for the youth in the Ship that helps on acquisition of new supplies, organizing events like our annual 7-9 day campout “long cruise”, SCUBA camp with B&W Diving of Channelview, Mini Cruise, and events like Sea Scout Academy or Safety at Sea held this year at the Coast Guard Station, Galveston, coming up in November. There is always plenty to do.